The UARCD is characterized by a diverse landscape. From the Newdale Plain to the border of Riding Mountain National Park the undulating topography can vary over 200 meters. The dominate feature of the landscape is the Assiniboine River meandering gently through the area. The Assiniboine River has carved an impressive valley. At times the valley is over 75 meters deep with steep slopes. The Assiniboine River Valley represents one of the most scenic aspects of the Conservation District, but also represents a major resource management issue. The surficial drainage flows generally to the southeast through a number of minor rivers and streams. Potholes are abundant in the prairie grassland region of the UARCD. 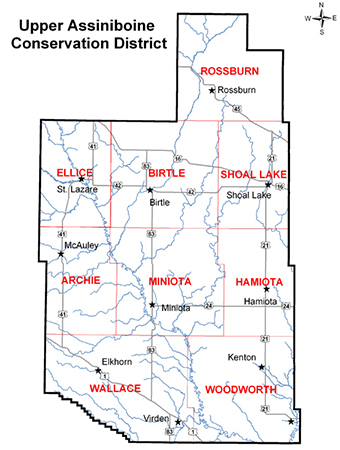 The UARCD consists of the municipalities of Archie, Ellice, Rossburn, Hamiota, Prairie View, Shoal Lake, Wallace and Woodworth covering over 2,200 square miles. To put size into perspective our Conservation District is larger than the province of Prince Edward Island. The UARCD can be divided into three distinct landscapes: uplands, plains and river valleys. To see a landscape that is capable of supporting our environmental, economic and social well being for now and into the future. To provide leadership in resource planning, implementation of programs and promotion of conservation practices. 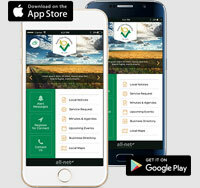 Living and promoting the conservation ethic for our whole environment; Adding value to agriculture through conservation; Strengthening and empowering rural communities; Demonstrating accountability and value for money in all initiatives.